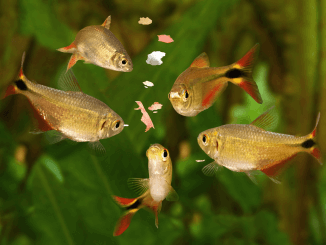 Goldfish are one of the most popular freshwater fish in the aquarium industry. Most people are familiar with the standard golden colored ones, but did you know there are a huge variety of other fancy goldfish available? Whilst it used to be normal to keep these beautiful fish in a bowl, more and more people are beginning to realize that these fish require a lot more space than they are typically getting. Goldfish thrive in large planted tanks, with lots of space to swim around. Goldfish (Carassius auratus) are freshwater fish that have been around since the Sung Dynasty in 970-1278. They are a direct descendent from carp, from the Cyprinidae family. 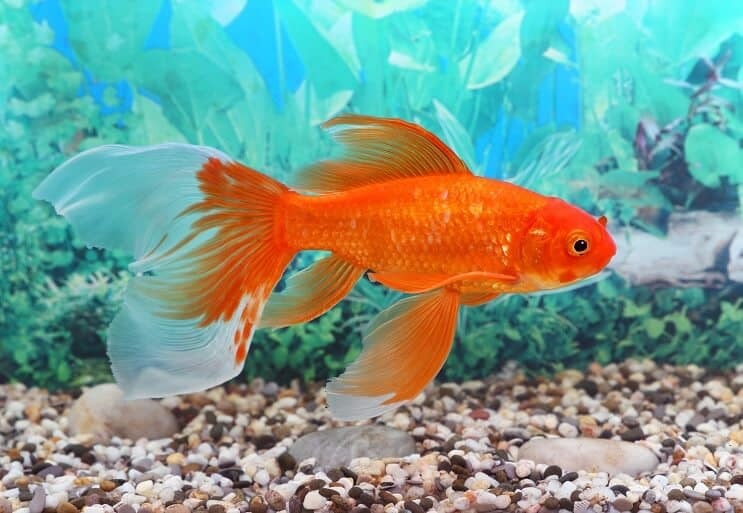 In the wild, carp are typically dull in color, whereas goldfish have been bred to develop beautiful bright colors, with unique fin and tail shapes. The reason that their history and origin is important is that it can help us to understand what their natural habitat should be like, and how we can replicate this in a tank. They come from slow moving bodies of water such as rivers, and are even found in lakes and large ponds across Asia. They are also typically surrounded by lots of vegetation, so you will need to make sure your tank is well planted. These fish create a lot of waste, so you will need a strong filter. Unlike lots of other freshwater fish, these fish don’t need a heater – they are a cold water species. The water should stay between 50-75°F. There is a common misconception that fish will only grow to the size of the tank they are put in. This is not true, and it can be extremely damaging to your fish. 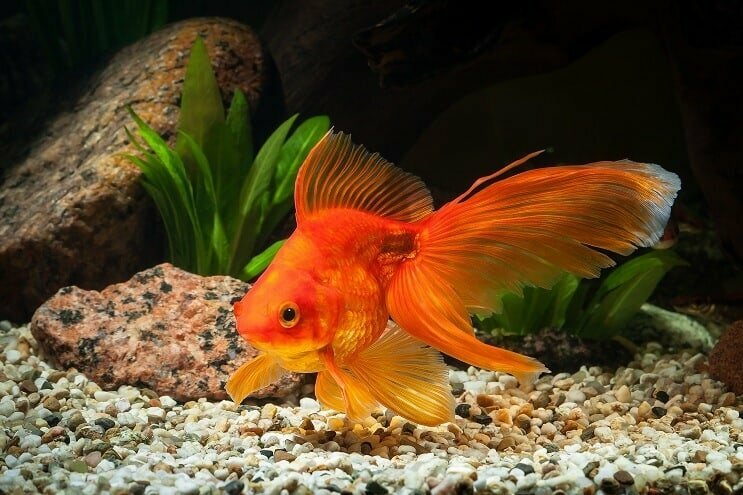 Most goldfish need a minimum of 20 gallons, but there are some species which need up to 50 gallons such as the comet and others which even require 75 gallons like the shubunkin. A rectangular shaped tank is the best for your fish, stay away from novelty tanks or tall tanks. The perfect starter kit for beginners. This includes almost everything you need to keep a goldfish. At only a fraction more of the cost of our affordable tank only option, this kit comes complete with everything you need to set up your goldfish aquarium. This kit comes complete with a clip-on filter and some filter cartridges, an LED lighting system integrated into the hood and water conditioner and a biological supplement to start your cycle off. It also comes with fish food, a fish net and a complete care guide on setting your aquarium up. This is the perfect tank for a beginner aquarist. You just need to add substrate, decorations and your goldfish! Tank Dimensions: 24 x 12.5 x 16.6 inches. Filter is quiet with an adjustable flow. Adaptable filter allows you to add different mediums. No room for adjustments to filter position – there is a cut hole in the lid. No hinged lid – need to remove the whole lid to clean. No cover over the feeding cut out. This 20 gallon glass fish tank is large enough for one common goldfish, and ideal if you want to choose your own equipment. If you are just looking for a tank, so you can choose the rest of the equipment yourself, this is the most affordable tank we’re featuring on this list. This 20 gallon glass tank is an ideal size for beginners. The beauty of choosing a standalone tank is that you can add equipment as and when you like. You might have personal preferences when it comes to choosing the filter and lights, which you just don’t get when buying a kit. You’ll also need to buy a hood and a stand for this tank. Tank Dimensions: 24 x 12 x 16 inches. Tank only so you can build the kit you want. Nice simple shape makes it easy to clean. No other equipment with it. Sometimes comes with black silicone rather than clear. This acrylic aquarium comes in a number of different sizes, this one is great for two goldfish. This tank comes in a few different sizes from 15 to 50 gallons, but the 40 gallon is perfect for a pair of regular goldfish. Made of acrylic, this tank is stronger, lighter and clearer than other regular glass aquariums. 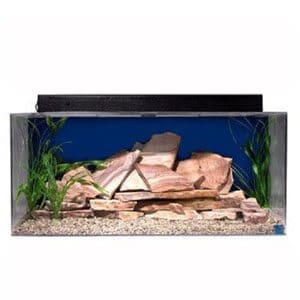 This is also ideal if you have children as acrylic tanks are less prone to cracking or chipping. It comes with a reflector and a lighting fixture, so you’ll still need to add your own filter. There are three background options to choose from too. Tank Dimensions: 36 x 15 x 16 inches. Rounded corners (great safety feature). Water lines don’t show on acrylic. Have to move the light to feed the fish. Doesn’t come with lighting, only the fixture. The hood is quite flimsy. 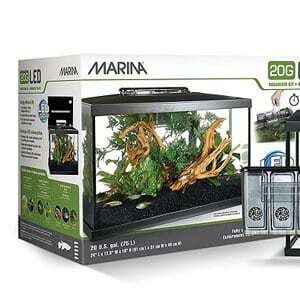 This 40 gallon tank is great if you want to choose your own equipment and start from scratch. If you’re not looking for a complete kit and you’d like to build your own setup, then this is the ideal tank for you. This luxury aquarium is top of the range and is perfect for a couple of regular goldfish or one large fancy variety. 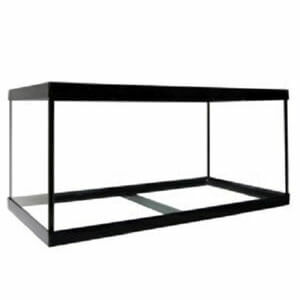 With diamond polished edges, distortion free glass and a sleek black frame around the top and bottom, this tank would fit in well in a stylish modern home. All their aquariums are rigorously inspected and exceed industry standards. They also use commercial grade silicone which enhances the look as well as making it leak proof. Tank Dimensions: 36 x 18 x 16 inches. Very good quality and thick glass. Smooth edges (great safety feature). Doesn’t come with any equipment. You’ll need to buy a hood which fits this exact size. Ideal for a shubunkin or comet goldfish, this tank allows plenty of space for them to swim around. If you want a top of the range complete kit, this is the one for you. With a choice of three colors (blue, clear or black) this aquarium comes with almost everything you need to start your goldfish tank. The kit includes an acrylic aquarium, hood with light fitting, a filter, plastic plants, a fish net, water conditioner and fish food. It also comes with a complete guide detailing how to set the tank up. Acrylic aquariums are stronger and lighter than glass. Efficient and economical to run. Includes most of the equipment you need to start your tank. Cut outs are large enough to use a different filter. Difficult to get large decorations in and out. Equipment is packed inside the tank and can scratch the tank in transition. The top is not removable. A powerful external filter to take care of your goldfishes waste and keep your tank clean. Goldfish produce a lot of waste and are messy fish, so it’s important you have a good quality filter. The job of the filter is to remove solid waste, remove the toxins that have built up, and to help aerate the water. 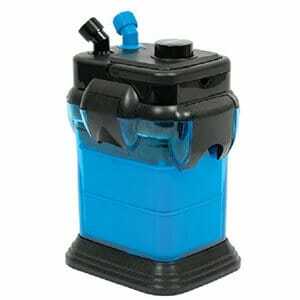 You will need a 3 stage filter, which will deal with the biological, mechanical and chemical filtration. An external filter would be perfect for their tank. 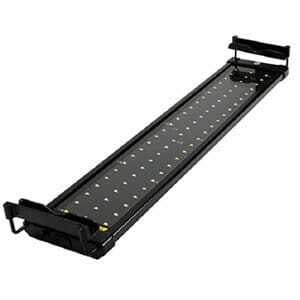 This bright, energy efficient LED light is perfect for your goldfish aquarium, with two settings for day and night light. Studies have shown that goldfish actually don’t need much light. 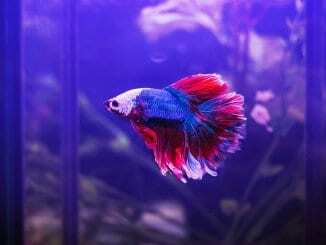 However, other things in your aquarium (e.g. plants) will need light. If you’re including plants in your tank, you will also need some lights to help to stimulate plant growth. The strength of lights that you choose will depend on the species, for example java moss only requires low light. There are a few different options when it comes to buying your fish tank. You can buy a used one, buy online, or buy from a shop. Make sure there are no obvious cracks or damage. Make sure you clean it thoroughly (you can use hot water and white vinegar). Check it for water-tightness before filling it. If you want to buy a new tank online, you can use any of the above tanks – all of which make great goldfish tanks. Setting up your goldfish tank is no different than setting up any other fish tank. Keep the tank away from windows and any heat sources. Clean the tank to remove any dust that’s built up while it was being stored, and then add a layer of sand or gravel. If you’re using gravel choose one that has grains which are larger than a pea as these fish like to sift and may swallow smaller pieces. Set up your equipment, but don’t turn anything on at this point. Fill the tank with de-chlorinated water, and add your plants and decorations. You can now turn the equipment on and allow it to cycle for 4-6 weeks. It’s important that you fully cycle the tank. This encourages a good bed of bacteria to build up, which will handle the ammonia and nitrites in your tank. 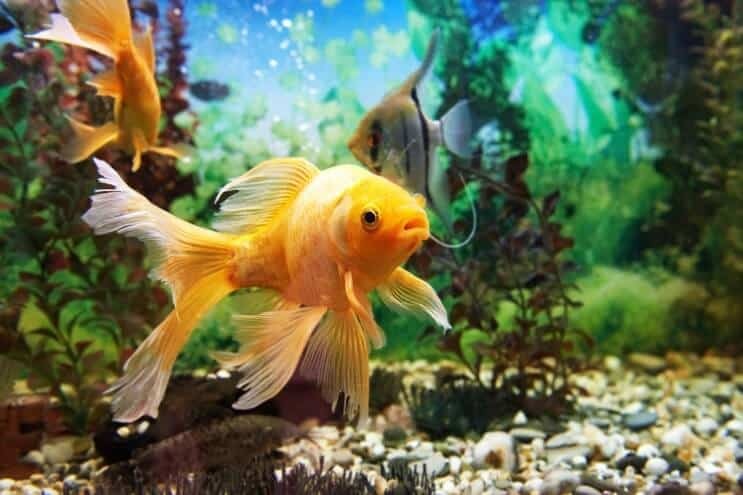 You will need to set up a maintenance schedule for cleaning your goldfish tank, there will be some tasks you need to perform every day, whilst others you only need to do once a month. Remove any large chunks of uneaten food. Perform a 25% water change. Use an algae magnet to remove algae build up. Clean the gravel with a siphon. Check all equipment is working and not damaged. Check water parameters (ammonia, nitrites, nitrates, pH). Change filter (according to manufacturer’s instructions). 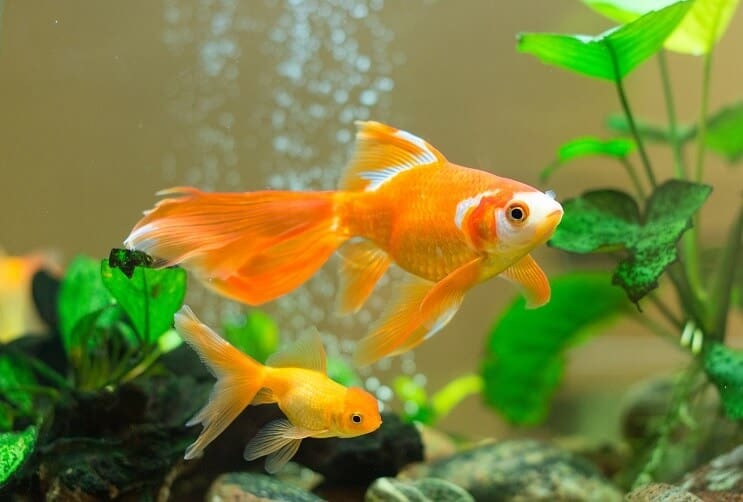 By keeping on top of your maintenance, you will reduce the risk of infection and disease in the tank and keep your goldfish happy and healthy. How Many Goldfish Can Be Kept In A 10 Gallon Tank? 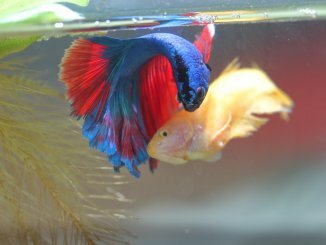 You cannot keep any goldfish in a 10 gallon tank – it is not big enough for them. Comet goldfish need a minimum tank size of 50 gallons; if you’re going to keep a pair you will need a 75 gallon tank. 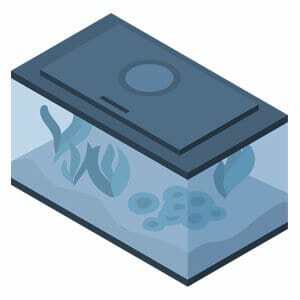 Hopefully you now understand that there isn’t a one size fits all tank when it comes to selecting the right aquarium for your goldfish. The tank size will depend on the type of goldfish you want to keep, and also how many of them you want to keep. If you are keeping the common goldfish, and are looking for a complete kit which is ready to go then the Marina Starter Kit will be the right one for you. Whereas if you are keeping one of the larger varieties such as the comet goldfish you’ll need a 50 gallon tank and the SeaClear Set will be a better fit.